Whenever I come across a good writing tip, I think, "Ooh, I should share this on MMW." Sometimes this means one tip inspires an entire post, but sometimes there are just too many and I get ants in my pants and decide you simply cannot write another sentence without KNOWING these amazing tips, my fellow MMWs! So today I present you with a few of my favorites I've come across in the last few weeks (mostly as I've been procrastinating writing by browsing Pinterest- but at least I've been browsing writing-related stuff!) and I realized only after starting this post that these are all character-related. 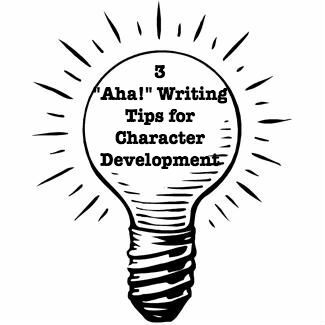 I'm a very big fan of character-driven stories, and I struggle a lot with writing characters, so maybe that's why I gravitate toward these tips. Yes. So much yes. 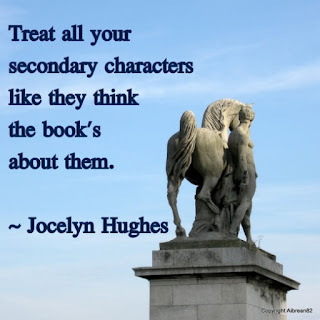 I think sometimes we think of secondary characters as "the help" and forget that they have their own passions, fears, strengths, weaknesses, and backstories. What are they? How does this story affect them? This is what makes our stories 3-D: when we do this extra work, when we get to know a character. Are we going to explain all of this in our story? No, probably not, because it would be unnecessary and likely detract from the story. But it will show up in the way a character reacts to your MC: is she irritated? Secretly happy? Your MC may never know, but YOU knowing is what will make that secondary character look sideways at your MC, or scuff her foot, or sigh, or react in whatever way that reminds us that she's a person too. I love this. I just love it so much. I have a secondary character in my book who is a woman in her 50s, graying hair, tanned cheeks, windblown look, walks with a limp, and doesn't like to be called "ma'am." I didn't know why I liked her so much, but maybe this is why- because she's very specific. I love this challenge to "make each description so clear, so specific, it could be no other person in the world." This ties right in with #1, and it gives me some pretty clear criteria with which to evaluate my own character and place descriptions. I especially loved that part about how if the author gives you that one quirky detail about a character's face, "you will make up the rest of her face with absolute clarity." That's so true! I think sometimes we try to over-describe, and this just reminded me how unnecessary that is.